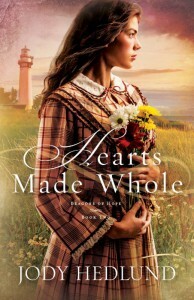 Hearts Made Whole is the second in Jody Hedlund's Beacons of Hope series, all of which are fictionalized histories of actual lighthouse keepers and lighthouses of the Great Lakes. Set in 1865, this particular story is set at Michigan's Windmill Point Lighthouse and the main characters are at least partially based on an actual couple who were its keepers. Twenty year old Caroline has been tending the lighthouse ever since her father drowned, leaving her and her four brothers and sisters orphaned. Though she excels at the job, the district lighthouse inspector is determined to evict Caroline and her family. Ryan Chambers, a Civil War veteran who was wounded at Gettysburg (and a secondary character in the first Beacons of Hope book), is hired to replace her. Overall, this is a nicely crafted story of two people who turn to God in their pain and uncertainty as they grow to love and attempt to trust in each other. This review refers to a review ebook copy, read courtesy of the publisher through NetGalley, in exchange for an honest review.